The United Nations Educational, Scientific and Cultural Organization (UNESCO; French: Organisation des Nations unies pour l'éducation, la science et la culture) is a specialized agency of the United Nations (UN) based in Paris. Its declared purpose is to contribute to peace and security by promoting international collaboration through educational, scientific, and cultural reforms in order to increase universal respect for justice, the rule of law, and human rights along with fundamental freedom proclaimed in the United Nations Charter. It is the successor of the League of Nations' International Committee on Intellectual Cooperation. UNESCO has 193 member states and 11 associate members. Most of its field offices are "cluster" offices covering three or more countries; national and regional offices also exist. UNESCO pursues its objectives through five major programs: education, natural sciences, social/human sciences, culture and communication/information. Projects sponsored by UNESCO include literacy, technical, and teacher-training programs, international science programs, the promotion of independent media and freedom of the press, regional and cultural history projects, the promotion of cultural diversity, translations of world literature, international cooperation agreements to secure the world's cultural and natural heritage (World Heritage Sites) and to preserve human rights, and attempts to bridge the worldwide digital divide. It is also a member of the United Nations Development Group. UNESCO's aim is "to contribute to the building of peace, the eradication of poverty, sustainable development and intercultural dialogue through education, the sciences, culture, communication and information". Other priorities of the organization include attaining quality Education For All and lifelong learning, addressing emerging social and ethical challenges, fostering cultural diversity, a culture of peace and building inclusive knowledge societies through information and communication. The broad goals and objectives of the international community—as set out in the internationally agreed development goals, including the Millennium Development Goals (MDGs)—underpin all UNESCO strategies and activities. UNESCO and its mandate for international cooperation can be traced back to a League of Nations resolution on 21 September 1921, to elect a Commission to study feasibility. This new body, the International Committee on Intellectual Cooperation (ICIC) was indeed created in 1922. On 18 December 1925, the International Bureau of Education (IBE) began work as a non-governmental organization in the service of international educational development. However, the onset of World War II largely interrupted the work of these predecessor organizations. After the signing of the Atlantic Charter and the Declaration of the United Nations, the Conference of Allied Ministers of Education (CAME) began meetings in London which continued from 16 November 1942 to 5 December 1945. On 30 October 1943, the necessity for an international organization was expressed in the Moscow Declaration, agreed upon by China, the United Kingdom, the United States and the USSR. This was followed by the Dumbarton Oaks Conference proposals of 9 October 1944. Upon the proposal of CAME and in accordance with the recommendations of the United Nations Conference on International Organization (UNCIO), held in San Francisco in April–June 1945, a United Nations Conference for the establishment of an educational and cultural organization (ECO/CONF) was convened in London 1–16 November 1945 with 44 governments represented. The idea of UNESCO was largely developed by Rab Butler, the Minister of Education for the United Kingdom, who had a great deal of influence in its development. At the ECO/CONF, the Constitution of UNESCO was introduced and signed by 37 countries, and a Preparatory Commission was established. The Preparatory Commission operated between 16 November 1945, and 4 November 1946—the date when UNESCO's Constitution came into force with the deposit of the twentieth ratification by a member state. The first General Conference took place from 19 November to 10 December 1946, and elected Dr. Julian Huxley to Director-General. The Constitution was amended in November 1954 when the General Conference resolved that members of the Executive Board would be representatives of the governments of the States of which they are nationals and would not, as before, act in their personal capacity. This change in governance distinguished UNESCO from its predecessor, the ICIC, in how member states would work together in the organization's fields of competence. As member states worked together over time to realize UNESCO's mandate, political and historical factors have shaped the organization's operations in particular during the Cold War, the decolonization process, and the dissolution of the USSR. Among the major achievements of the organization is its work against racism, for example through influential statements on race starting with a declaration of anthropologists (among them was Claude Lévi-Strauss) and other scientists in 1950 and concluding with the 1978 Declaration on Race and Racial Prejudice. In 1956, the Republic of South Africa withdrew from UNESCO saying that some of the organization's publications amounted to "interference" in the country's "racial problems." South Africa rejoined the organization in 1994 under the leadership of Nelson Mandela. UNESCO's early work in the field of education included the pilot project on fundamental education in the Marbial Valley, Haiti, started in 1947. This project was followed by expert missions to other countries, including, for example, a mission to Afghanistan in 1949. In 1948, UNESCO recommended that Member States should make free primary education compulsory and universal. In 1990, the World Conference on Education for All, in Jomtien, Thailand, launched a global movement to provide basic education for all children, youths and adults. Ten years later, the 2000 World Education Forum held in Dakar, Senegal, led member governments to commit to achieving basic education for all by 2015. UNESCO's early activities in culture included, for example, the Nubia Campaign, launched in 1960. The purpose of the campaign was to move the Great Temple of Abu Simbel to keep it from being swamped by the Nile after construction of the Aswan Dam. During the 20-year campaign, 22 monuments and architectural complexes were relocated. This was the first and largest in a series of campaigns including Mohenjo-daro (Pakistan), Fes (Morocco), Kathmandu (Nepal), Borobudur (Indonesia) and the Acropolis (Greece). The organization's work on heritage led to the adoption, in 1972, of the Convention concerning the Protection of the World Cultural and Natural Heritage. The World Heritage Committee was established in 1976 and the first sites inscribed on the World Heritage List in 1978. Since then important legal instruments on cultural heritage and diversity have been adopted by UNESCO member states in 2003 (Convention for the Safeguarding of the Intangible Cultural Heritage) and 2005 (Convention on the Protection and Promotion of the Diversity of Cultural Expressions). An intergovernmental meeting of UNESCO in Paris in December 1951 led to the creation of the European Council for Nuclear Research, which was responsible for establishing the European Organization for Nuclear Research (CERN) in 1954. Arid Zone programming, 1948–1966, is another example of an early major UNESCO project in the field of natural sciences. In 1968, UNESCO organized the first intergovernmental conference aimed at reconciling the environment and development, a problem which continues to be addressed in the field of sustainable development. The main outcome of the 1968 conference was the creation of UNESCO's Man and the Biosphere Programme. In the field of communication, the "free flow of ideas by word and image" has been in UNESCO's constitution from its beginnings, following the experience of the Second World War when control of information was a factor in indoctrinating populations for aggression. In the years immediately following World War II, efforts were concentrated on reconstruction and on the identification of needs for means of mass communication around the world. UNESCO started organizing training and education for journalists in the 1950s. In response to calls for a "New World Information and Communication Order" in the late 1970s, UNESCO established the International Commission for the Study of Communication Problems, which produced the 1980 MacBride report (named after the Chair of the Commission, the Nobel Peace Prize laureate Seán MacBride). The same year, UNESCO created the International Programme for the Development of Communication (IPDC), a multilateral forum designed to promote media development in developing countries. In 1991, UNESCO's General Conference endorsed the Windhoek Declaration on media independence and pluralism, which led the UN General Assembly to declare the date of its adoption, 3 May, as World Press Freedom Day. Since 1997, UNESCO has awarded the UNESCO / Guillermo Cano World Press Freedom Prize every 3 May. In the lead up to the World Summit on the Information Society in 2003 (Geneva) and 2005 (Tunis), UNESCO introduced the Information for All Programme. UNESCO admitted Palestine as a member in 2011. Laws passed in the United States in 1990 and 1994 mean that it cannot contribute financially to any UN organisation that accepts Palestine as a full member. As a result, it withdrew its funding which accounted for about 22% of UNESCO's budget. Israel also reacted to Palestine's admittance to UNESCO by freezing Israel payments to the UNESCO and imposing sanctions to the Palestinian Authority, stating that Palestine's admittance would be detrimental "to potential peace talks". Two years after they stopped paying their dues to UNESCO, US and Israel lost UNESCO voting rights in 2013 without losing the right to be elected; thus, the US was elected as a member of the Executive Board for the period 2016–19. UNESCO implements its activities through the five programme areas: education, natural sciences, social and human sciences, culture, and communication and information. UNESCO Chairs, an international network of 644 UNESCO Chairs, involving over 770 institutions in 126 countries. UNESCO ASPNet, an international network of 8,000 schools in 170 countries. UNESCO does not accredit institutions of higher learning. Seville Statement on Violence: A statement adopted by UNESCO in 1989 to refute the notion that humans are biologically predisposed to organised violence. City of Literature; in 2007, the first city to be given this title was Edinburgh, the site of Scotland's first circulating library. In 2008, Iowa City, Iowa became the City of Literature. Generating knowledge through publications such as World Trends in Freedom of Expression and Media Development, the UNESCO Series on Internet Freedom, and the Media Development Indicators, as well as other indicator-based studies. World Press Freedom Day, 3 May each year, to promote freedom of expression and freedom of the press as a basic human right and as crucial components of any healthy, democratic and free society. Criança Esperança in Brazil, in partnership with Rede Globo, to raise funds for community-based projects that foster social integration and violence prevention. Health Education for Behavior Change program in partnership with the Ministry of Education of Kenya which was financially supported by the Government of Azerbaijan to promote health education among 10-19-year-old young people who live in informal camp in Kibera, Nairobi. The project was carried out between September 2014 - December 2016. Migration Museums Initiative: Promoting the establishment of museums for cultural dialogue with migrant populations. UNESCO-CEPES, the European Centre for Higher Education: established in 1972 in Bucharest, Romania, as a de-centralized office to promote international co-operation in higher education in Europe as well as Canada, USA and Israel. Higher Education in Europe is its official journal. Free Software Directory: since 1998 UNESCO and the Free Software Foundation have jointly funded this project cataloguing free software. FRESH Focussing Resources on Effective School Health. The UNESCO transparency portal has been designed to enable public access to information regarding Organization's activities, such as its aggregate budget for a biennium, as well as links to relevant programmatic and financial documents. These two distinct sets of information are published on the IATI registry, respectively based on the IATI Activity Standard and the IATI Organization Standard. There have been proposals to establish two new UNESCO lists. The first proposed list will focus on movable cultural heritage such as artifacts, paintings, and biofacts. The list may include cultural objects, such as the Jōmon Venus of Japan, the Mona Lisa of France, the Gebel el-Arak Knife of Egypt, The Ninth Wave of Russia, the Seated Woman of Çatalhöyük of Turkey, the David (Michelangelo) of Italy, the Mathura Herakles of India, the Manunggul Jar of the Philippines, the Crown of Baekje of South Korea, The Hay Wain of the United Kingdom and the Benin Bronzes of Nigeria. The second proposed list will focus on the world's living species, such as the Komodo Dragon of Indonesia, the Panda of China, the Bald eagle of North American countries, the Aye-aye of Madagascar, the Asiatic Lion of India, the Kakapo of New Zealand, and the Mountain tapir of Colombia, Ecuador and Peru. UNESCO and its specialized institutions issue a number of magazines. The UNESCO Courier magazine states its mission to "promote UNESCO's ideals, maintain a platform for the dialogue between cultures and provide a forum for international debate." Since March 2006 it is available online, with limited printed issues. Its articles express the opinions of the authors which are not necessarily the opinions of UNESCO. There was a hiatus in publishing between 2012 and 2017. In 1950, UNESCO initiated the quarterly review Impact of Science on Society (also known as Impact) to discuss the influence of science on society. The journal ceased publication in 1992. UNESCO also published museum international quarterly from the year 1948. The institutes are specialized departments of the organization that support UNESCO's programme, providing specialized support for cluster and national offices. As of January 2019, UNESCO has 193 member states and 11 associate members. Some members are not independent states and some members have additional National Organizing Committees from some of their dependent territories. UNESCO state parties are the United Nations member states (except Liechtenstein, United States and Israel), as well as Cook Islands, Niue and Palestine. The United States and Israel left UNESCO on 31 December 2018. There has been no elected UNESCO Director-General from Southeast Asia, South Asia, Central and North Asia, Middle East, North Africa, East Africa, Central Africa, South Africa, Australia-Oceania, and South America since inception. The Directors-General of UNESCO came from West Europe (5), Central America (1), North America (2), West Africa (1), East Asia (1), and East Europe (1). Out of the 11 Directors-General since inception, women have held the position only twice. Qatar, the Philippines, and Iran are proposing for a Director-General bid by 2021 or 2025. There have never been a Middle Eastern or Southeast Asian UNESCO Director-General since inception. The ASEAN bloc and some Pacific and Latin American nations support the possible bid of the Philippines, which is culturally Asian, Oceanic, and Latin. Qatar and Iran, on the other hand, have fragmented support in the Middle East. Egypt, Israel, and Madagascar are also vying for the position but have yet to express a direct or indirect proposal. Both Qatar and Egypt lost in the 2017 bid against France. UNESCO headquarters are located at Place de Fontenoy in Paris, France. UNESCO's field offices across the globe are categorized into four primary office types based upon their function and geographic coverage: cluster offices, national offices, regional bureaus and liaison offices. 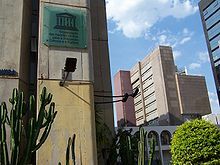 The following list of all UNESCO Field Offices is organized geographically by UNESCO Region and identifies the members states and associate members of UNESCO which are served by each office. Carondelet Palace, Presidential Palace – with changing of the guards. The Historic Center of Quito, Ecuador, is one of the largest, least-altered and best-preserved historic centers in the Americas. This center was, together with the historic centre of Kraków in Poland, the first to be declared World Heritage Site by UNESCO on 18 September 1978. UNESCO has been the centre of controversy in the past, particularly in its relationships with the United States, the United Kingdom, Singapore and the former Soviet Union. During the 1970s and 1980s, UNESCO's support for a "New World Information and Communication Order" and its MacBride report calling for democratization of the media and more egalitarian access to information was condemned in these countries as attempts to curb freedom of the press. UNESCO was perceived as a platform for communists and Third World dictators to attack the West, in contrast to accusations made by the USSR in the late 1940s and early 1950s. In 1984, the United States withheld its contributions and withdrew from the organization in protest, followed by the United Kingdom in 1985. Singapore withdrew also at the end of 1985, citing rising membership fees. Following a change of government in 1997, the UK rejoined. The United States rejoined in 2003, followed by Singapore on 8 October 2007. Israel was admitted to UNESCO in 1949, one year after its creation. Israel has maintained its membership since 1949. In 2010, Israel designated the Cave of the Patriarchs, Hebron and Rachel's Tomb, Bethlehem as National Heritage Sites and announced restoration work, prompting criticism from the Obama administration and protests from Palestinians. In October 2010, UNESCO's Executive Board voted to declare the sites as "al-Haram al-Ibrahimi/Tomb of the Patriarchs" and "Bilal bin Rabah Mosque/Rachel's Tomb" and stated that they were "an integral part of the occupied Palestinian Territories" and any unilateral Israeli action was a violation of international law. UNESCO described the sites as significant to "people of the Muslim, Christian and Jewish traditions", and accused Israel of highlighting only the Jewish character of the sites. Israel in turn accused UNESCO of "detach[ing] the Nation of Israel from its heritage", and accused it of being politically motivated. The Rabbi of the Western Wall said that Rachel's tomb had not previously been declared a holy Muslim site. Israel partially suspended ties with UNESCO. Israeli Deputy Foreign Minister Danny Ayalon declared that the resolution was a "part of Palestinian escalation". Zevulun Orlev, chairman of the Knesset Education and Culture Committee, referred to the resolutions as an attempt to undermine the mission of UNESCO as a scientific and cultural organization that promotes cooperation throughout the world. On 28 June 2011, UNESCO's World Heritage Committee, at Jordan's insistence, censured[clarification needed] Israel's decision to demolish and rebuild the Mughrabi Gate Bridge in Jerusalem for safety reasons. Israel stated that Jordan had signed an agreement with Israel stipulating that the existing bridge must be dismantled for safety reasons; Jordan disputed the agreement, saying that it was only signed under U.S. pressure. Israel was also unable to address the UNESCO committee over objections from Egypt. In January 2014, days before it was scheduled to open, UNESCO Director-General, Irina Bokova, "indefinitely postponed" and effectively cancelled an exhibit created by the Simon Wiesenthal Center entitled "The People, The Book, The Land: The 3,500-year relationship between the Jewish people and the Land of Israel." The event was scheduled to run from 21 January through 30 January in Paris. Bokova cancelled the event after representatives of Arab states at UNESCO argued that its display would "harm the peace process". The author of the exhibition, Professor Robert Wistrich of the Hebrew University's Vidal Sassoon International Center for the Study of Anti-Semitism, called the cancellation an "appalling act," and characterized Bokova's decision as "an arbitrary act of total cynicism and, really, contempt for the Jewish people and its history." UNESCO amended the decision to cancel the exhibit within the year, and it quickly achieved popularity and was viewed as a great success. On January 1 2019, Israel formally left UNESCO in pursuance of the US withdrawal over the perceived continuous anti-Israel bias. On 13 October 2016, UNESCO passed a resolution on East Jerusalem that condemned Israel for "aggressions" by Israeli police and soldiers and "illegal measures" against the freedom of worship and Muslims' access to their holy sites, while also recognizing Israel as the occupying power. Palestinian leaders welcomed the decision. While the text acknowledged the "importance of the Old City of Jerusalem and its walls for the three monotheistic religions", it referred to the sacred hilltop compound in Jerusalem's Old City only by its Muslim name "Al-Haram al-Sharif", Arabic for Noble Sanctuary. In response, Israel denounced the UNESCO resolution for its omission of the words "Temple Mount" or "Har HaBayit," stating that it denies Jewish ties to the key holy site. After receiving criticism from numerous Israeli politicians and diplomats, including Benjamin Netanyahu and Ayelet Shaked, Israel froze all ties with the organization. The resolution was condemned by Ban Ki-moon and the Director-General of UNESCO, Irina Bokova, who said that Judaism, Islam and Christianity have clear historical connections to Jerusalem and "to deny, conceal or erase any of the Jewish, Christian or Muslim traditions undermines the integrity of the site. Al-Aqsa Mosque is also Temple Mount, whose Western Wall is the holiest place in Judaism." It was also rejected by the Czech Parliament which said the resolution reflects a "hateful anti-Israel sentiment", and hundreds of Italian Jews demonstrated in Rome over Italy's abstention. On 26 October, UNESCO approved a reviewed version of the resolution, which also criticized Israel for its continuous "refusal to let the body's experts access Jerusalem's holy sites to determine their conservation status." Despite containing some softening of language following Israeli protests over a previous version, Israel continued to denounce the text. The resolution refers to the site Jews and Christians refer to as the Temple Mount, or Har HaBayit in Hebrew, only by its Arab name — a significant semantic decision also adopted by UNESCO's executive board, triggering condemnation from Israel and its allies. U.S. Ambassador Crystal Nix Hines stated: "This item should have been defeated. These politicized and one-sided resolutions are damaging the credibility of UNESCO." In October 2017, the United States and Israel announced they would withdraw from the organization, citing in-part anti-Israel bias. In February 2011, an article was published in a Palestinian youth magazine in which a teenage girl described one of her four role-models as Adolf Hitler. In December 2011, UNESCO, which partly funded the magazine, condemned the material and subsequently withdrew support. In 2012, UNESCO decided to establish a chair at the Islamic University of Gaza in the field of astronomy, astrophysics, and space sciences, fueling controversy and criticism. Israel bombed the school in 2008 stating that they develop and store weapons there, which Israel restated in criticizing UNESCO's move. The head, Kamalain Shaath, defended UNESCO, stating that "the Islamic University is a purely academic university that is interested only in education and its development". Israeli ambassador to UNESCO Nimrod Barkan planned to submit a letter of protest with information about the university's ties to Hamas, especially angry that this was the first Palestinian university that UNESCO chose to cooperate with. The Jewish organization B'nai B'rith criticized the move as well. On 16 and 17 February 2012, UNESCO held a conference entitled "The Media World after WikiLeaks and News of the World." Despite all six panels being focused on WikiLeaks, no member of WikiLeaks staff was invited to speak. After receiving a complaint from WikiLeaks spokesman Kristinn Hrafnsson, UNESCO invited him to attend, but did not offer a place on any panels. The offer also came only a week before the conference, which was held in Paris, France. Many of the speakers featured, including David Leigh and Heather Brooke, had spoken out openly against WikiLeaks and its founder Julian Assange in the past. WikiLeaks released a press statement on 15 February 2012 denouncing UNESCO which stated, "UNESCO has made itself an international human rights joke. To use 'freedom of expression' to censor WikiLeaks from a conference about WikiLeaks is an Orwellian absurdity beyond words." This decision is more than an insult to the families of those Cubans who were lined up and summarily executed by Che and his merciless cronies but it also serves as a direct contradiction to the UNESCO ideals of encouraging peace and universal respect for human rights. UN Watch also condemned this selection by UNESCO. In 2015, Japan threatened to halt funding for UNESCO over the organization's decision to include documents relating to the 1937 Nanjing massacre in the latest listing for its "Memory of the World" program. In October 2016, Japanese Foreign Minister Fumio Kishida confirmed that Japan's 2016 annual funding of ¥4.4 billion had been suspended although denied any direct link with the Nanjing document controversy. The United States withdrew from UNESCO in 1984, citing the "highly politicized" nature of the organisation, its ostensible "hostility toward the basic institutions of a free society, especially a free market and a free press," as well as its "unrestrained budgetary expansion." and poor management under then Director General Amadou-Mahter M'Bow of Senegal. The reasons for the withdrawal of the United States from UNESCO in 1984 are well-known; my view is that we overreacted to the calls of some who wanted to radicalize UNESCO, and the calls of others who wanted the United States to lead in emasculating the UN system. The fact is UNESCO is one of the least dangerous international institutions ever created. While some member countries within UNESCO attempted to push journalistic views antithetical to the values of the west, and engage in Israel bashing, UNESCO itself never adopted such radical postures. The U.S. opted for empty-chair diplomacy, after winning, not losing, the battles we engaged in… It was nuts to get out, and would be nuttier not to rejoin. On 12 October 2017, the United States notified UNESCO that it will again withdraw from the organization on 31 December 2018 and will seek to establish a permanent observer mission beginning in 2019. The Department of State cited "mounting arrears at UNESCO, the need for fundamental reform in the organization, and continuing anti-Israel bias at UNESCO." Israel praised the withdrawal decision as "brave" and "moral." The United States has not paid over $600 million in dues since it stopped paying its $80 million annual UNESCO dues when Palestine became a full member in 2011. Israel and the US were among the 14 votes against the membership out of 194 member countries. On May 25, 2016, the noted Turkish poet and human rights activist Zülfü Livaneli resigned as Turkey's only UNESCO goodwill ambassador. He highlighted human rights situation in Turkey and destruction of historical Sur district of Diyarbakir, the largest city in Kurdish-majority southeast Turkey, during fighting between the Turkish army and Kurdish militants as the main reasons for his resignation. Livaneli said: "To pontificate on peace while remaining silent against such violations is a contradiction of the fundamental ideals of UNESCO." In 1981, UNESCO and the UN celebrated the Atatürk Centennial, despite his involvement in the Greek genocide and in suppressing the Dersim rebellion. UNESDOC – Contains over 146,000 UNESCO documents in full text published since 1945 as well as metadata from the collections of the UNESCO Library and documentation centres in field offices and institutes. UNESCO develops, maintains and disseminates, free of charge, two interrelated software packages for database management (CDS/ISIS [not to be confused with UK police software package ISIS]) and data mining/statistical analysis (IDAMS). CDS/ISIS – a generalised information storage and retrieval system. The Windows version may run on a single computer or in a local area network. The JavaISIS client/server components allow remote database management over the Internet and are available for Windows, Linux and Macintosh. Furthermore, GenISIS allows the user to produce HTML Web forms for CDS/ISIS database searching. The ISIS_DLL provides an API for developing CDS/ISIS based applications. OpenIDAMS – a software package for processing and analysing numerical data developed, maintained and disseminated by UNESCO. The original package was proprietary but UNESCO has initiated a project to provide it as open-source. ^ "UNESCO". UNESCO. Retrieved 25 September 2013. ^ "UNESCO history". UNESCO. Retrieved 23 April 2010. ^ Grandjean, Martin (2018). Les réseaux de la coopération intellectuelle. La Société des Nations comme actrice des échanges scientifiques et culturels dans l'entre-deux-guerres [The Networks of Intellectual Cooperation. The League of Nations as an Actor of the Scientific and Cultural Exchanges in the Inter-War Period]. Lausanne: Université de Lausanne. (English summary). ^ "List of UNESCO members and associates". UNESCO. Retrieved 11 March 2019. ^ "UNDG Members". United Nations Development Group. Archived from the original on 11 May 2011. Retrieved 8 August 2010. ^ "Introducing UNESCO". UNESCO. Retrieved 8 August 2011. ^ "UNESCO • General Conference; 34th; Medium-term Strategy, 2008–2013; 2007" (PDF). Retrieved 8 August 2011. ^ Plenary Meetings, Records of the Second Assembly, Geneva: League of Nations, 5 September – 5 October 1921 . ^ A Chronology of UNESCO: 1945–1987 (PDF), UNESDOC database, Paris, December 1987, LAD.85/WS/4 Rev, The International Committee on Intellectual Cooperation (ICIC) was officially created on 4 January 1922, as a consultative organ composed of individuals elected based on their personal qualifications. The International Institute for Intellectual Cooperation (IIIC) was then created in Paris on 9 August 1925, to act as the executing agency for the ICIC . ^ The work of U.N.E.S.C.O. (Hansard, 26 January 1949). Millbank systems. Retrieved 12 July 2013. ^ "United Nations Conference for the Establishment of an Educational and Cultural Organisation. Conference for the Establishment of an Educational and Cultural Organisation" (PDF). UNESDOC database. The Institute of Civil Engineers, London. 1–16 November 1945. ECO/Conf./29. Retrieved 8 June 2012. ^ "General Conference, First Session" (PDF). UNESDOC database. UNESCO House, Paris, from 20 November to 10 December 1946. UNESCO/C/30 [1 C/Resolutions] Item 14, p. 73: UNESCO. 1947. Retrieved 1 July 2012. ^ "Records of the General Conference, Eighth Session" (PDF). unesdoc.unesco.org. ^ "UNESCO. (1950). Statement by experts on race problems. Paris, 20 July 1950. UNESCO/SS/1. UNESDOC database" (PDF). Retrieved 8 June 2012. ^ "UNESCO. General Conference, 20th Session. (1979). Records of the General Conference, Twentieth Session, Paris, 24 October to 28 November 1978. 20 C/Resolutions. (Paris.) Resolution 3/1.1/2, p. 61. UNESDOC database" (PDF). Retrieved 8 June 2012. ^ UNESCO. Executive Board, 42nd Session. (1955). Report of the Director-General on the Activities of the Organization (March–November 1955). Paris, 9 November 1955. 42 EX/43. Part I Relations with Member States, paragraph 3. ^ The Haiti pilot project: phase one, 1947–1949. (1951). Monographs on Fundamental Education IV. UNESCO: Paris. ^ "Debiesse, J., Benjamin, H. and Abbot, W. (1952). Report of the mission to Afghanistan. Educational Missions IV. ED.51/VIII.A. (Paris.) UNESDOC database" (PDF). Retrieved 8 June 2012. ^ "UNESCO. General Conference, 2nd Session. (1948). Resolutions adopted by the General Conference during its second session, Mexico, November–December 1947. 2 C/Resolutions. (Paris.) Resolution 3.4.1, p. 17. UNESDOC database" (PDF). Retrieved 8 June 2012. ^ "UNDP, UNESCO, UNICEF, and The World Bank. (1990). Final Report. World Conference on Education for All: Meeting Basic Education Needs. 5–9 March 1990, Jomtien, Thailand. (WCEFA Inter-agency Commission: New York). UNESDOC database" (PDF). Retrieved 8 June 2012. ^ "UNESCO. (2000). The Dakar Framework for Action. Education for All: meeting our collective commitments (including six regional frameworks for action). World Education Forum, Dakar, Senegal, 26–28 April 2000. ED.2000/WS/27. (Paris). UNESDOC database" (PDF). Retrieved 8 June 2012. ^ "UNESCO. General Conference, 21st Session. (1980). International Campaign to Save the Monuments of Nubia: Report of the Executive Committee of the Campaign and of the Director-General. 26 August 1980. 21 C/82. UNESDOC database" (PDF). Retrieved 8 June 2012. ^ "Convention concerning the Protection of the World Cultural and Natural Heritage. Paris, 16 November 1972. UNESCO. General Conference, 17th Session. Records of the General Conference, Seventeenth Session, Paris, 17 October to 21 November 1972. Volume I: Resolutions, Recommendations. 17 C/Resolution 29. Chapter IX Conventions and Recommendations, p. 135. UNESDOC database" (PDF). Retrieved 8 June 2012. ^ "UNESCO. Intergovernmental Committee for the Protection of the World Cultural and Natural Heritage, Second Session. Final Report. Washington, DC, 5–8 September 1978. CC-78/CONF.010/10 Rev. UNESDOC database" (PDF). Retrieved 8 June 2012. ^ "Convention for the Safeguarding of the Intangible Cultural Heritage. Paris, 17 October 2003. UNESCO. General Conference, 32nd Session. Records of the General Conference, Thirty-second Session, Paris, 29 September to 17 October 2003. Volume I: Resolutions. 32 C/Resolution 32. Chapter IV Programme for 2004–2005, Major Programme IV – Culture, p. 53. UNESDOC database" (PDF). Retrieved 8 June 2012. ^ "Convention on the Protection and Promotion of the Diversity of Cultural Expressions. Paris, 20 October 2005. UNESCO. General Conference, 33rd Session. Records of the General Conference. Thirty-third Session, Paris, 3–21 October 2005. Volume I: Resolutions. 33 C/Resolution 41. Chapter V Programme for 2006–2007, p. 83. UNESDOC database" (PDF). Retrieved 8 June 2012. ^ "UNESCO. Executive Board, 26th Session. Resolutions and decisions adopted by the Executive Board at its twenty-sixth session. (7 June to 9 July 1951). Paris, 27 July 1951. 26 EX/Decisions. Item 7 Programme, Resolution 7.2.2.1, p. 9. UNESDOC database" (PDF). Retrieved 8 June 2012. ^ "UNESCO. General Conference, 3rd Session. (1949). Records of the General Conference of the United Nations Educational, Scientific and Cultural Organization. Third Session. Beirut, 1948. Volume II: Resolutions. (UNESCO: Paris). 2 C/Resolution 3.7, page 23. UNESDOC database" (PDF). Retrieved 8 June 2012. ^ ""Use and conservation of the biosphere: Proceedings of the intergovernmental conference of experts on the scientific basis for rational use and conservation of the resources of the biosphere. Paris, 4–13 September 1968." (1970.) In Natural Resources Research, Volume X. SC.69/XIL.16/A. UNESDOC database" (PDF). Retrieved 8 June 2012. ^ "Constitution of the United Nations Educational, Scientific and Cultural Organization" (PDF). ^ "UNESCO. (1955). International Expert Meeting on Professional Training for Journalism. Unesco House, 9–13 April 1956. Purpose and Scope. Paris, 18 November 1955. UNESCO/MC/PT.1. UNESDOC database" (PDF). Retrieved 8 June 2012. ^ "UNESCO. General Conference, 19th Session. (1977). Approved Programme and budget for 1977–1978. Paris, February 1977. 19 C/5, p. 332, paragraphs 4154 and 4155. UNESDOC database" (PDF). Retrieved 8 June 2012. ^ "MacBride, S. (1980). Many voices, one world: towards a new, more just, and more efficient world information and communication order. (UNESCO: Paris). UNESDOC database" (PDF). Retrieved 8 June 2012. ^ "About IPDC | United Nations Educational, Scientific and Cultural Organization". www.unesco.org. Retrieved 15 December 2016. ^ "International Programme for the Development of Communication (IPDC) | United Nations Educational, Scientific and Cultural Organization". www.unesco.org. Retrieved 19 December 2016. ^ "World Press Freedom Day 2016". UNESCO. 2 February 2016. Retrieved 19 December 2016. ^ "General Conference admits Palestine as UNESCO Member". 31 October 2011. Retrieved 11 December 2011. ^ Blomfield, Adrian (31 October 2011). "US withdraws Unesco funding after it accepts Palestinian membership". The Telegraph. Retrieved 31 October 2011. ^ "Limitation on Contributions to the United Nations and Affiliated Organizations" (PDF). The New York Times. Retrieved 12 October 2017. ^ Erlanger, Steven; Sayare, Scott (31 October 2011). "Unesco Approves Full Membership for Palestinians". The New York Times. Retrieved 31 October 2011. ^ "After UNESCO vote, Israeli sanctions on Palestinian Authority anger U.S." Haaretz. 4 November 2011. Retrieved 11 December 2011. ^ "Israel freezes UNESCO funds". CNN. 3 December 2011. Archived from the original on 6 November 2011. Retrieved 11 December 2011. ^ "U.S., Israel lose voting rights at UNESCO over Palestine row". Reuters. 8 November 2013. Retrieved 29 June 2014. ^ Because diploma mills have claimed false UNESCO accreditation, UNESCO itself has published warnings against education organizations that claim UNESCO recognition or affiliation. See Luca Lantero, Degree Mills: non-accredited and irregular higher education institutions Archived 13 May 2015 at the Wayback Machine, Information Centre on Academic Mobility and Equivalence (CIMEA), Italy. and UNESCO "Alert: Misuse of UNESCO Name by Bogus Institutions"
^ Varga, Susan (2006). Edinburgh Old Town (Images of Scotland). The History Press Ltd. ISBN 978-0-7524-4083-5. ^ "Fostering Freedom of Expression". UNESCO. 30 January 2013. Retrieved 19 December 2016. ^ "Safety of Journalists". UNESCO. 22 May 2013. Retrieved 19 December 2016. ^ "UN Plan of Action | United Nations Educational, Scientific and Cultural Organization". www.unesco.org. Retrieved 19 December 2016. ^ "Building Knowledge Societies". UNESCO. 18 June 2013. Retrieved 19 December 2016. ^ "Memory of the World | United Nations Educational, Scientific and Cultural Organization". www.unesco.org. Retrieved 19 December 2016. ^ "Information for All Programme (IFAP) | United Nations Educational, Scientific and Cultural Organization". www.unesco.org. Retrieved 19 December 2016. ^ "Internet Universality | United Nations Educational, Scientific and Cultural Organization". www.unesco.org. Retrieved 19 December 2016. ^ "World Trends in Freedom of Expression and Media Development | United Nations Educational, Scientific and Cultural Organization". www.unesco.org. Retrieved 19 December 2016. ^ "UNESCO Series on Internet Freedom | United Nations Educational, Scientific and Cultural Organization". www.unesco.org. Retrieved 19 December 2016. ^ "Media Development Indicators (MDIs) | United Nations Educational, Scientific and Cultural Organization". www.unesco.org. Retrieved 19 December 2016. ^ "Promouvoir l'éducation à la santé chez les jeunes du campement informel de Kibera à Nairobi | Organisation des Nations Unies pour l'éducation, la science et la culture". unesco.org (in French). Retrieved 18 August 2017. ^ "Migration Institutions – Home". Migrationmuseums.org. Archived from the original on 5 March 2007. Retrieved 23 April 2010. ^ "Education | EDUCATION –". UNESCO. Archived from the original on 6 October 2009. Retrieved 23 April 2010. ^ Reddy, A (2014) 'Official support for GoUNESCO from UNESCO New Delhi – GoUNESCO', GoUNESCO. Uniform Resource Locator: http://www.gounesco.com/unesco-new-delhi-support-gounesco. ^ "Tangible Cultural Heritage - United Nations Educational, Scientific and Cultural Organization". www.unesco.org. ^ Centre, UNESCO World Heritage. "UNESCO World Heritage Centre - Document - Discovered artifacts under preservation, Archaeological Site, 18 Hoang Dieu street". whc.unesco.org. ^ "Archives". The UNESCO Courier. United Nations Educational, Scientific and Cultural Organization. 20 April 2017. Retrieved 14 November 2018. ^ "Science and Technology Education" (PDF). UNESCO. 1998. ^ "Quoted on UNESCO official site". Ngo-db.unesco.org. Archived from the original on 25 June 2012. Retrieved 1 July 2012. ^ "Full list of NGOs that have official relations with UNESCO". UNESCO. Retrieved 1 July 2012. ^ "UNESCO Headquarters Committee 107th session 13 Feb 2009". Ngo-db.unesco.org. Archived from the original on 25 June 2012. Retrieved 1 July 2012. ^ "International Bureau of Education". UNESCO. Retrieved 14 November 2018. ^ "About the Institute". UIL - UNESCO Institute for Lifelong Learning. 29 October 2015. Retrieved 14 November 2018. ^ "IIEP UNESCO". Retrieved 14 November 2018. ^ "Contact Us". UNESCO IITE. Retrieved 14 November 2018. ^ "Contact Us". IICBA. UNESCO. Retrieved 14 November 2018. ^ "Contact Us". IESALC (in Spanish). UNESCO. ^ "UNESCO-UNEVOC International Centre". Retrieved 14 November 2018. ^ "Home". IHE Delft Institute for Water Education. UNESCO. Retrieved 14 November 2018. ^ "Mission & History". ICTP - International Centre for Theoretical Physics. UNESCO. Retrieved 14 November 2018. ^ "Contact Us". UNESCO Institute for Statistics. 21 November 2016. Retrieved 14 November 2018. ^ International Days | United Nations Educational, Scientific and Cultural Organization. UNESCO. Retrieved 12 July 2013. ^ "International Day to End Impunity for Crimes against Journalists". UNESCO. Retrieved 19 December 2016. ^ "List of UNESCO members and associates". UNESCO. Retrieved 3 November 2011. ^ "Summary update on Government progress to become a State Party to the UNESCO International Convention against Doping in Sport" (PDF). WADA. p. 2. Archived from the original (PDF) on 16 January 2013. Retrieved 28 July 2009. ^ "State Parties". UNESCO. Retrieved 31 October 2011. ^ "Member States of the United Nations". United Nations. Retrieved 31 October 2011. ^ TOVAH LAZAROFF (31 December 2018). "ISRAEL, U.S. SLATED TO LEAVE UNESCO TODAY TO PROTEST ANTI-ISRAEL BIAS". JPost. Retrieved 31 December 2018. ^ "President of the 39th session of the General Conference". UNESCO. 5 October 2017. Retrieved 12 November 2017. ^ "President of the 38th session of the General Conference". UNESCO. Retrieved 11 November 2015. ^ "General Conference 37th | United Nations Educational, Scientific and Cultural Organization". www.unesco.org. Retrieved 25 September 2015. ^ Executive Board – Results of elections. UNESCO General Conference, November 2015. Retrieved 12 November 2015. ^ Table_2013-2015.pdf UNESCO Membership by Electoral Groups. Retrieved 12 November 2015. ^ "List of All UNESCO Field Offices by Region with Descriptions of Member State Coverage". UNESCO. ^ "City of Quito – UNESCO World Heritage". UNESCO. Retrieved 30 April 2010. ^ "UNESCO Office in Brasilia | United Nations Educational, Scientific and Cultural Organization". www.unesco.org. Retrieved 24 September 2015. ^ "Oficina de la UNESCO en Quito | Organización de las Naciones Unidas para la Educación, la Ciencia y la Cultura". www.unesco.org. Retrieved 24 September 2015. ^ Grahm, S. E. (April 2006). "The (Real)politiks of Culture: U.S. Cultural Diplomacy in UNESCO, 1946–1954". Diplomatic History. 30 (2): 231–51. doi:10.1111/j.1467-7709.2006.00548.x. ^ "Singapore to withdraw from UNESCO", The Telegraph, 28 December 1984 . ^ "Hebron clashes over Israel's West Bank heritage list". BBC News. 26 February 2010. ^ "Executive Board adopts five decisions concerning UNESCO's work in the occupied Palestinian and Arab Territories". UNESCO. 21 October 2010. ^ "THE TWO PALESTINIAN SITES OF AL-HARAM AL-IBRAHIMI/TOMB OF THE PATRIARCHS IN AL-KHALIL/HEBRON AND THE BILAL BIN RABAH MOSQUE/RACHEL'S TOMB IN BETHLEHEM" (PDF). ^ Hillel Fendel (1 November 2010). "UNESCO Erases Israeli Protests from Rachel's Tomb Protocol". Arutz Sheva. ^ Maayana Miskin (29 October 2010). "UN Org. : Rachel's Tomb is a Mosque". Arutz Sheva. ^ "Ayalon: Israel will no longer cooperate with UNESCO". The Jerusalem Post. 3 November 2010. ^ Shalom, Rabbi. "Cooperation with UNESCO only partially suspended". The Jerusalem Post. Retrieved 8 August 2011. ^ "UNESCO censures Israel over Mughrabi Bridge – Israel News, Ynetnews". Ynetnews. 20 June 1995. Retrieved 8 August 2011. ^ Berman, Lazar (17 January 2014). "UNESCO cancels event on Jewish ties to Land of Israel". The Times of Israel. Retrieved 21 January 2014. ^ Ahren, Raphael (21 January 2014). "Author of UNESCO's nixed Israel exhibit decries 'appalling betrayal'". The Times of Israel. Retrieved 21 January 2014. ^ a b "UNESCO adopts anti-Israel resolution on al-Aqsa Mosque". aljazeera.com. ^ "Commission report" (PDF). unesdoc.unesco.org. ^ "UNESCO fails to acknowledge Jewish ties to Temple Mount". 13 October 2016. ^ "Netanyahu leads angry denunciations of 'absurd' UNESCO decision". ^ "UNESCO chief 'received death threats' for opposing Jerusalem motion". Times of Israel. 17 October 2016. ^ "Statement by the Director-General of UNESCO on the Old City of Jerusalem and its Walls on the occasion of the 40th session of the World Heritage Committee of UNESCO in Istanbul - United Nations Educational, Scientific and Cultural Organization". ^ "UNESCO Director Criticizes Resolution: Temple Mount Sacred to Both Jews, Muslims". Haaretz. 14 October 2016. Retrieved 14 October 2016. ^ a b "Czech MPs slam 'hateful' UNESCO Jerusalem resolution". ^ "UNESCO approves new Jerusalem resolution". www.aljazeera.com. ^ Beaumont, Peter (26 October 2016). "Unesco adopts controversial resolution on Jerusalem holy sites". The Guardian. ^ "UNESCO resolution on Jerusalem holy sites draws criticism from U.S., Israel". CBC/Radio-Canada. 26 October 2016. ^ "The United States Withdraws From UNESCO". U.S. Department of State. Retrieved 12 October 2017. ^ Harris, Gardiner; Erlangeroct, Steven (12 October 2017). "U.S. Will Withdraw From Unesco, Citing Its 'Anti-Israel Bias'". The New York Times. Retrieved 8 April 2018. ^ "Unesco cuts funding for Palestinian youth magazine over Hitler praise". The Daily Telegraph. 23 December 2011. Retrieved 12 January 2012. ^ "UNESCO Chair in Astronomy, Astrophysics and Space Sciences (964), established in 2012 at The Islamic University of Gaza (Palestine)". UNESCO. Retrieved 15 July 2012. ^ The Goldstone Report: The Legacy of the Landmark Investigation of the Gaza Conflict By Adam Horowitz, Lizzy Ratner and Philip Weiss (2011). Google Books. ^ "Israel shocked by UNESCO Chair at Gaza Islamic University" (Press release). Israel ministry of foreign affairs. 12 July 2012. Retrieved 15 July 2012. ^ Higgins, Michael (12 July 2012). "UNESCO establishes chair at Gaza university accused of housing Hamas bomb labs". National Post. Retrieved 15 July 2012. ^ "Fatah: Shalit was held at Gaza Islamic University". Yedioth Ahronot. 6 February 2007. Retrieved 15 July 2012. ^ Cambanis, Thanassis (28 February 2010). "Hamas University". Boston Globe. Retrieved 15 July 2012. ^ Ravid, Barak (12 July 2012). "Israel furious at UNESCO decision to back science chair at Islamic University of Gaza". Haaretz. Retrieved 15 July 2012. ^ Yaakov, Yifa (14 July 2012). "B'nai Brith slams UNESCO affiliation with Gaza University". The Times of Israel. Retrieved 15 July 2012. ^ "News journalism in a digital world". UNESCO. 10 February 2012. Retrieved 15 February 2012. ^ "UNESCO-leaks to refute wikileaks accusation". UNESCO. 16 February 2012. Retrieved 16 February 2012. ^ "The Guardian's hatchet job on Julian Assange". World Socialist Web Site. 10 March 2011. Retrieved 15 February 2012. ^ "WikiLeaks denounces UNESCO after WikiLeaks banned from UNESCO conference on WikiLeaks". WikiLeaks. 15 February 2012. Retrieved 15 February 2012. ^ UNESCO Once Again Makes a Mockery of its Own Ideals by Glorifying Mass Murderer Che Guevara, Says Ros-Lehtinen (press release), House of representatives, 22 July 2013 . ^ (www.dw.com), Deutsche Welle. "Japan furious at UNESCO listing Nanjing Massacre documents - Asia - DW.COM - 19.10.2015". ^ "Japan halts Unesco funding following Nanjing massacre row". The Guardian. Agence France-Presse. 14 October 2016. Retrieved 30 October 2016. ^ a b c "UNESCO Membership: Issues for Congress". Congressional Research Service reports. 20 November 2003. Retrieved 28 March 2019. ^ a b "United States & UNESCO, Part 1". Starting from 05:08. C-SPAN. ^ Rosenberg, Eli; Morello, Carol (12 October 2017). "U.S. withdraws from UNESCO, the U.N.'s cultural organization, citing anti-Israel bias". The Washington Post. Retrieved 28 March 2019. ^ Irish, John (13 October 2017). "U.S., Israel quit UNESCO over alleged bias". Reuters. Retrieved 28 March 2019. ^ "Turkish writer quits UNESCO to protest damage to heritage, rights abuse". Reuters. May 26, 2016. ^ "UNESDOC Database - United Nations Educational, Scientific and Cultural Organization". www.unesco.org. ^ "Information Processing Tools". Unesco. Archived from the original on 8 January 2015. ^ "OpenIDAMS". Unesco. Archived from the original on 13 January 2015. This page is based on the Wikipedia article UNESCO; it is used under the Creative Commons Attribution-ShareAlike 3.0 Unported License (CC-BY-SA). You may redistribute it, verbatim or modified, providing that you comply with the terms of the CC-BY-SA.